Jungfraujoch, The Mountain That Took My Breath Away... Literally! 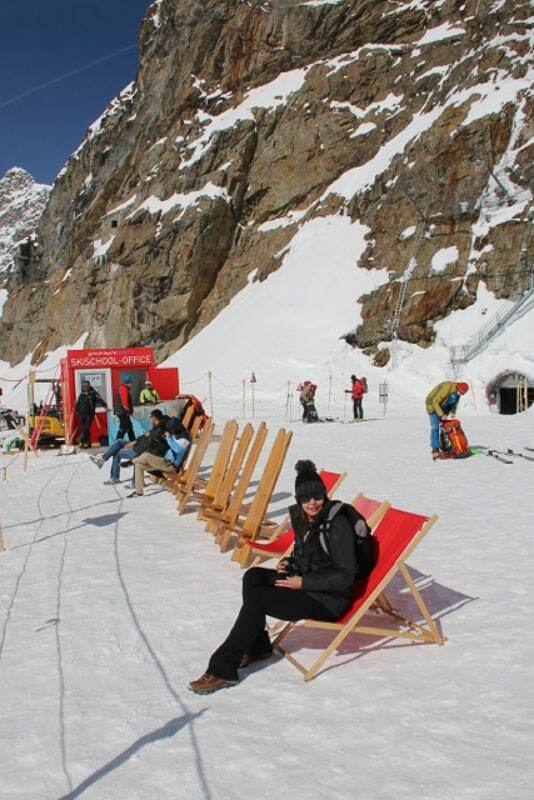 Home » Jungfraujoch, the Mountain that Took My Breath Away … Literally! 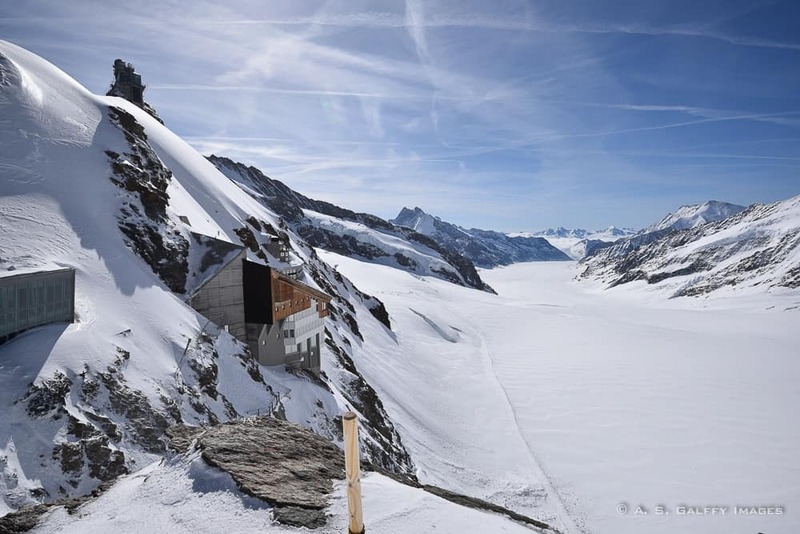 “So, what else is there to do atop the Jungfraujoch except visit the Observatory and the Ice Palace?” we ask the hotel receptionist on our way out to catch the cogwheel train to the Top of Europe. We wanted to know if there were any trails we could hike on the mountain of the everlasting snow. “There is a 45-minute walk to Monchsjoch Hut, a rest station where you can also enjoy some authentic Swiss food” she says. It sounds tempting. 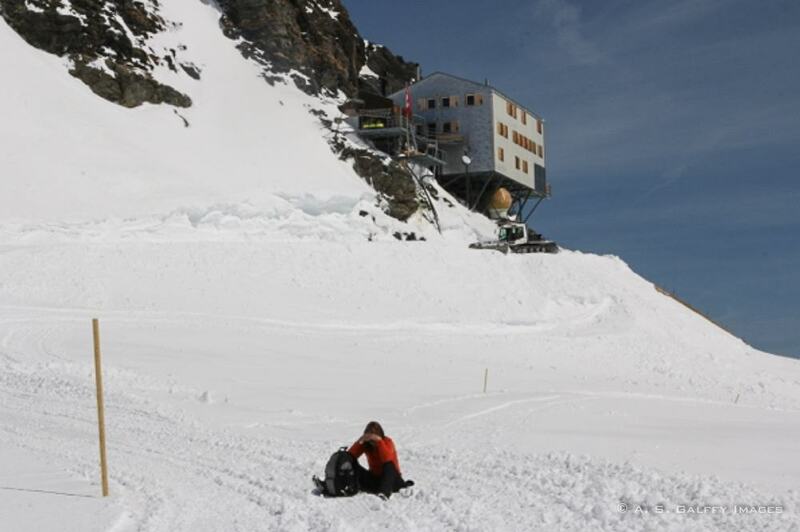 Since we have an early start this morning maybe we can aim for lunch at the Monchsjoch Hut, so off we go. 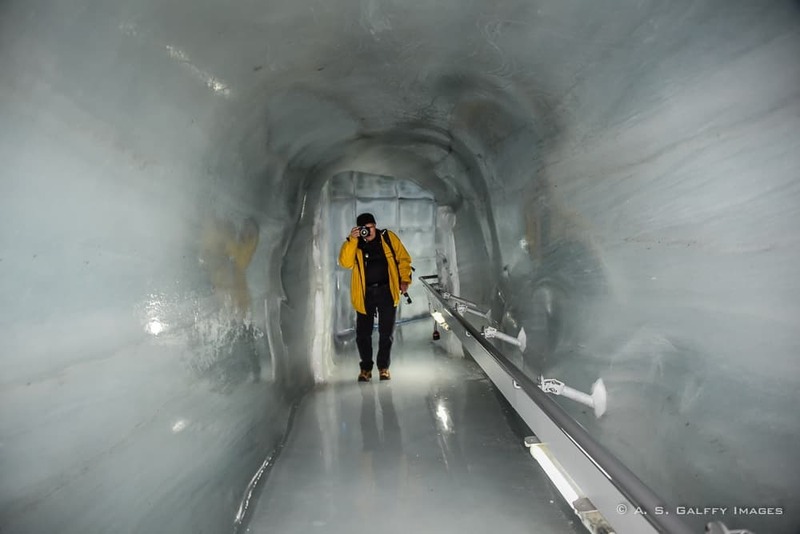 Riding the cogwheel train to the top of the Jungfraujoch is in itself is a great experience, but once you get up there you feel like in a totally different world. Ever since I first saw Switzerland, I keep thinking that God must have created this place to show the humankind what Paradise looks like. It’s difficult to imagine a more perfect scenery than the Alps reflecting their snow-capped peaks in the turquoise waters of the lakes at the foot of the mountains, or the pristine alpine meadows dotted with wild flowers, where cows graze peacefully. Yesterday when we watched the majestic summits of Eiger, Mönch and Jungfrau from atop the Harder Kulm, I thought there can’t be a much better view of this peak. But I was wrong. 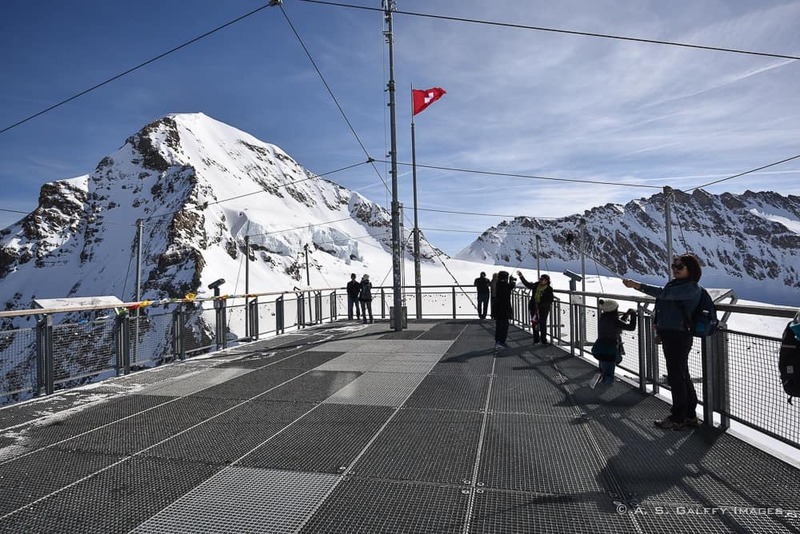 No matter how impressive Jungfraujoch looks from a distance, it doesn’t compare to the feeling you get when you step out unto the viewing platform of the Sphinx Observatory, at 3,500 meters altitude. Standing amidst this world of glaciers and everlasting snow makes your heart skip a beat. So here we are, finally! At the Top of Europe. Up here you feel indeed on top of the world. As the train stops, we just take a few steps from the dark train platform and find ourselves in the middle of a glass building flooded by light. This is the Sphinx Hall and wow, it’s so bright! The reflection of the clean, white snow outside is so strong that it almost blinds our eyes. Not much to do here though. Some souvenir shops, restroom facilities and a couple of small restaurants. So we continue to the outside snow platform for our first encounter with the windy and cold reality of this place. “Brrr! 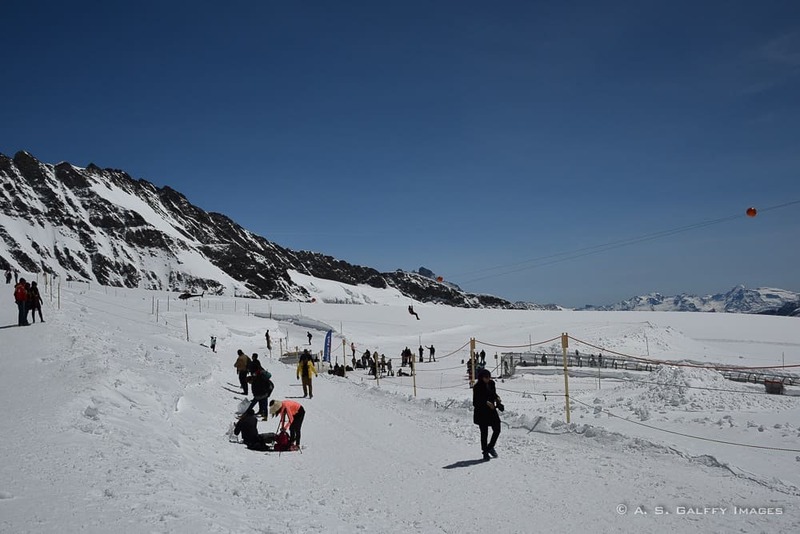 Hang on to something, you’ll be blown away!” Exactly as Mount Titlis that is always covered in snow, Jungfraujoch also experiences snow year round. Ah, but the view! The pristine snow glowing in the early morning sun, the mountain peaks… In spite of the fierce wind, the scene is actually surprisingly peaceful. From the snow platform you can take the elevator down to the Alpine Sensation, Ice Palace and outside to the “snow fun” area, or up to the observation deck of the Sphinx Observatory. Unfortunately, the signs here are pretty confusing, so we wander around for a while ending up in the same place before we finally figure out which is where. We finally make it up to the observation deck of the Sphinx Observatory, the highest elevation structure in Europe that was named after the rocky summit on which it is located. The 360º panorama of the Aletsch Glacier and the surrounding peaks is absolutely fantastic! If you take the elevator down from the Sphinx Hall you will descend into the heart of the rock at the Alpine Sensation. 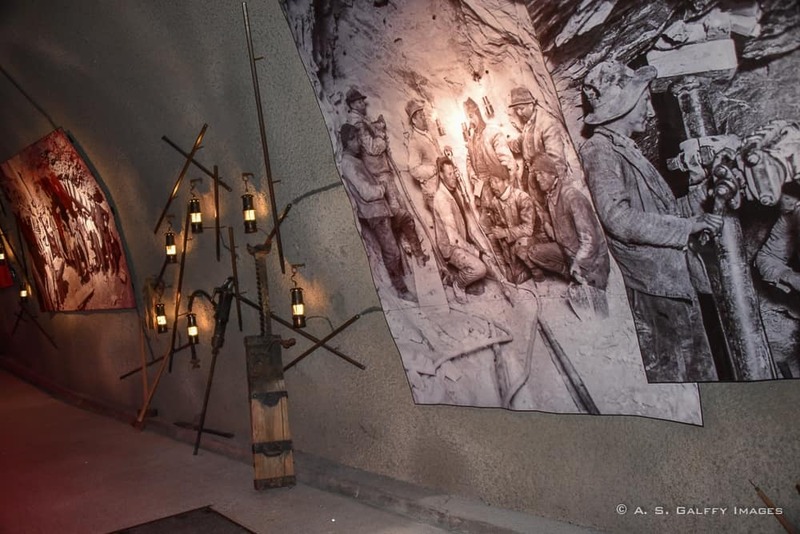 This is a 250 meters long subway-like corridor where you can explore the touristic development in the Alps and history of the Jungfrau Railway with images, light and music. There is also a film-projection room with a giant snow dome and original photographs made during construction of the Jungfrau Railway. From the Alpine Sensation the corridor continues to the Ice Palace, another big area inside the mountain, where all the corridors and the halls are carved in solid ice. Here you can see various sculptures made of ice, like wildlife and other exhibits. Walkways here may be very slippery, depending on the kind of footwear you have. So off we go leaving the “snow fun” area behind. The path seems pretty well groomed and not very steep. It’s going to be an easy hike, we are used to way more difficult ones. As we go along, a group of skiers with backpacks passes us. They glide with so much ease, I almost envy them. Soon though there is no one around us and we can’t even see the observatory anymore. I look at my watch. It’s been 50 minutes since we started hiking and our destination is nowhere in sight. I struggle. Didn’t she say 45 minutes? I feel a little short of breath, but I don’t want to panic. The scenery is breathtakingly beautiful, so I’m going to concentrate on that. Laszlo is ahead and doesn’t seem to be so tired. Why am I so tired? I didn’t seem to have made such a big physical effort and still I feel unusually fatigued and light-headed. I’m almost gasping for air. At almost 3,500 m altitude, my body is showing clear symptoms of altitude sickness. Now I am in panic. I would like to turn back, but by now we are probably closer to the Monchsjoch Hut than to the Observatory, so we better continue. But my feet seem so heavy, as if they are made of lead. Every 4-5 steps I have to stop and rest. • Come early. The best time to visit is in the morning. It is less crowded and the weather is better. Usually the clouds gather mid to early afternoon. • Come prepared. No matter when you visit, remember this is the place of the everlasting snow. Bring a warm jacket, shoes for walking on snow, a hat, gloves, sunglasses and especially sunscreen. • Wait for good weather. 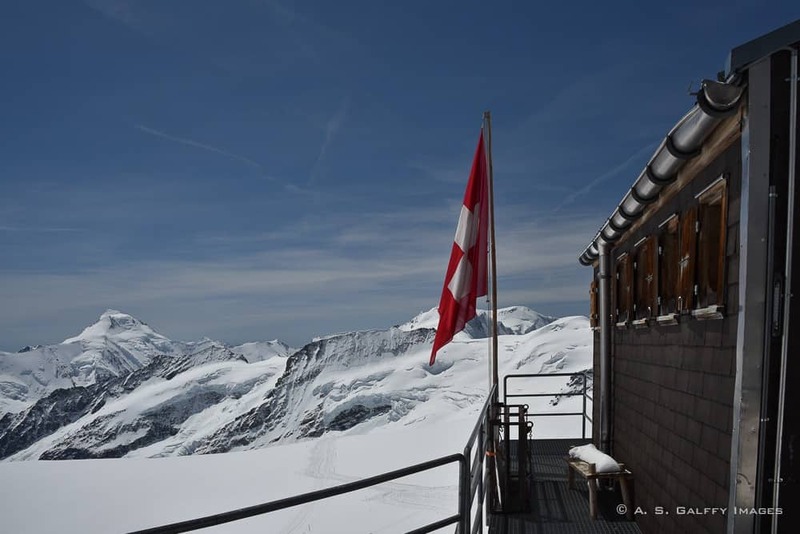 Jungfraujoch is all about the magnificent views. Coming up here when it’s foggy or cloudy is a waste of money and a big disappointment. • Bring drinking water. If you buy it at up here you’ll pay around $8 for a small bottle. Water is supposed to help minimize and even prevent altitude sickness. • Watch out for altitude sickness. Higher altitudes will impair your physical performance, so a hike that you usually do effortlessly my seem like a strenuous exercise at a high elevation. 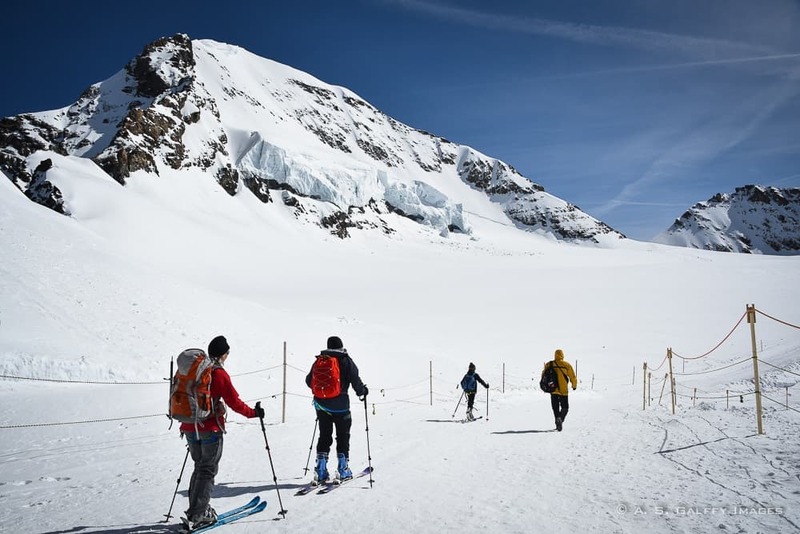 Did you know that the Jungfrau region is a training base for the olympic athletes? Whether they are training for running, triathlon, cycling, open water swimming, or other sports many of the world’s top athletes use this area as a training base for improving their physical capabilities. Dear Anda, My husband thinks just a wearing a smart wool base layer, fleece pull over and windbreaker should be warm enough for mid May but I think we should bring our light down jackets as they pack into small bags. Also is it cold in train ride, I hate being cold and I would rather be prepared. Both my college age boys are coming with us and they said they don't need down jackets. What is your opinion? Thank you getting excited leaving in 2 weeks!! Hi Ann, Glad to hear your journey is only two weeks away. I'm sure you are going to have a blast in Switzerland. Your husband is probably right about the windbreaker and the fleece pull over. The best thing is to dress up in layers. However, I'd take the light down jackets as well. Better safe than sorry. I wore a winter jacket when I went there, but after hiking for half an hour I ended up in a sweater. It was a very sunny day with no wind that day, but if the wind starts blowing it may get pretty cold. Enjoy your trip. 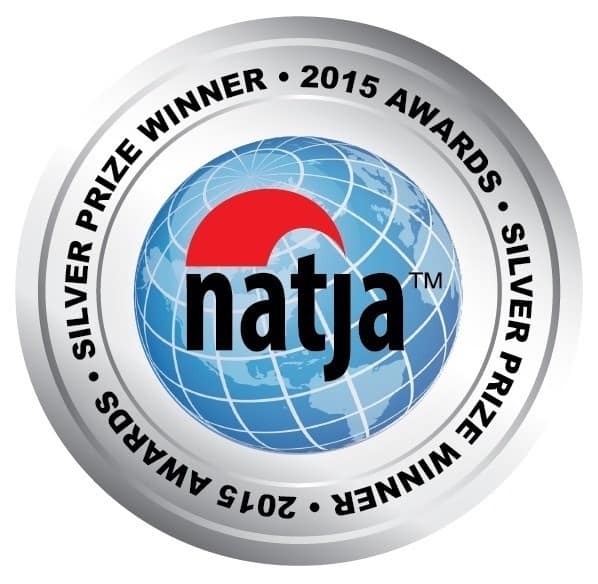 Exhilarating post, Anda ~ Easy to see how this article earned you the Silver Prize in the Travel Series category in 2015's NATJA Annual Awards. Your words and photographs took me right up there with you! Thank you, Melodie. I'm very happy you took time to read my post. I loved it up there, on the 'top of Europe'! Hi Anda, The information you have is great. We are taking our 2 college sons after the oldest graduation for a trip to europe on May 17th this year. 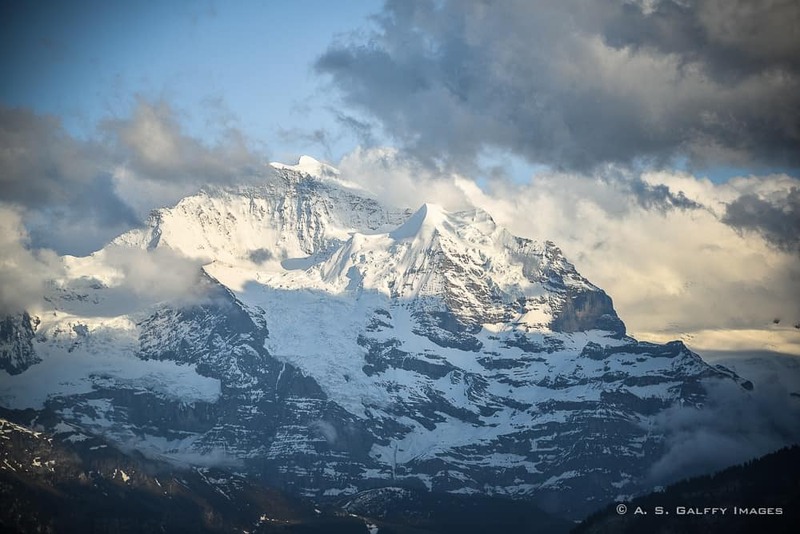 We are planning on 3 night staying in Wengen and going up to the Jungfrau one day. I am 62 and was a little scared going up that high as to the safety of walking around. But your information helped calm my fears. I defiantly will not do the hike to the hut as I also suffer from Afib. You only feel altitude sickness from the hiking not from just being on the observation deck or walking in the ice palace right? I am so glad you mentioned having hiking boots and warm clothes as I wasn't sure if we needed to pack them but now I will. As we are then driving to Italy from Interlaken either Lake Como or Cinque Terre then to Tuscany, Venice and back into alps as my husband wants to drive the High Alpine Road and fly home from Munich. Since Italy is warmer I didn't know if we needed warmer clothing but now I know. One other thing you mentioned you went in Spring what dates actually did you travel? I was there in mid May, Anne, and the weather was gorgeous. Didn't have one drop of rain, but I guess that's a matter of luck. 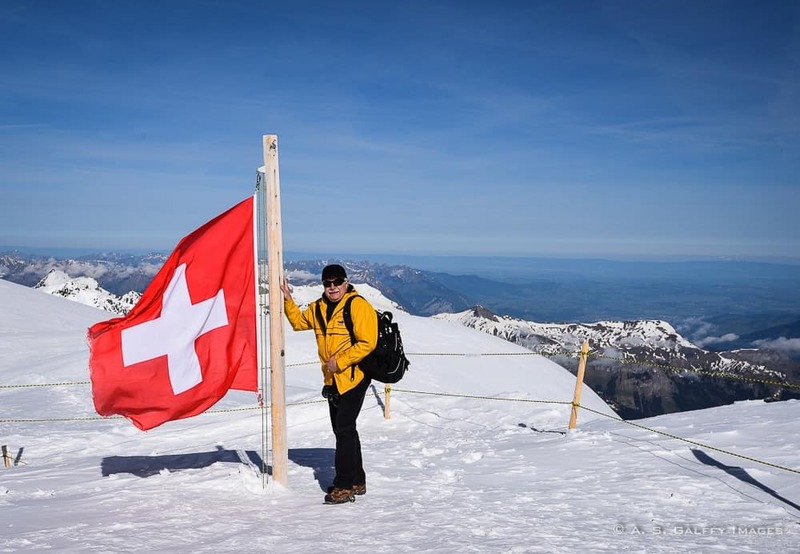 You can go to Jungfraujoch even from Interlaken, it's no big deal. Just take the first morning train if possible. Usually the weather is better in the morning up the mountain. You will not have altitude sickness up there if you don't walk for too long. You can even walk outside for a little and play in the snow. I took a pretty long hike that's why I felt so bad. As for the trip to Lake Como, we crossed into Italy from St.Moritz and the road was absolutely divine. Make sure you allow plenty of time for this trip so that you can stop and enjoy the scenery. 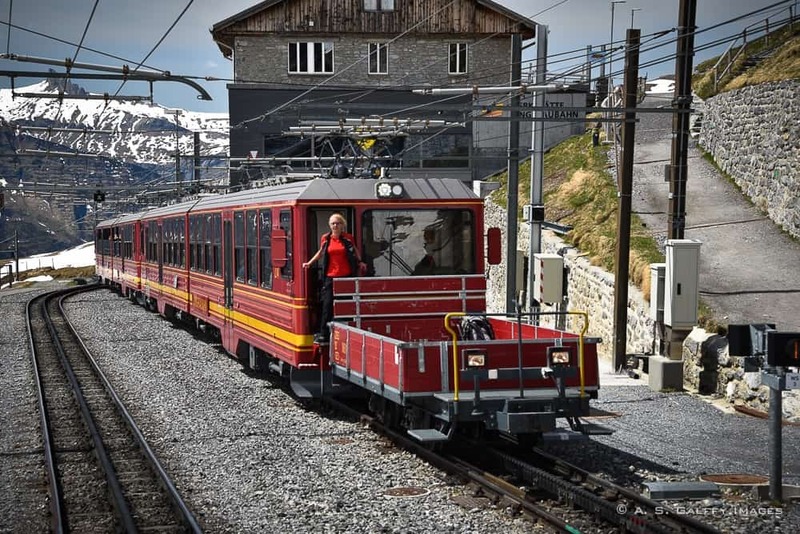 The cog train up Jungfraujoch sounds like quite the experience. We chuckled a little about the idea of "hiking" - it was probably more a slip-and-fall kind of experience with so much snow around. The cross-country skiing would be easier no doubt! (Sorry it wasn't really worth it in the end - but you wouldn't have known that if you hadn't tried it.) Good to know that you have to be prepared for some serious wind and cold :-). Makes me laugh when I think back at my experience, but it was pretty scary at the time. Thank you for your comment, Janet. Anda, I have not been up the Jungfrau in a very long time, but I have experience altitude sickness and it is no fun. Good for you for powering through it. I won't be hiking to that restaurant in my future! Thanks a million for linking up with #wkendtravelinspiration! Smart choice Corinne. It wasn't really worth it. The food was less than mediocre and I literally thought I won't make it. I love that area of Switzerland. I am sorry that you felt the effects of the altitude. I was totally surprised that I didn't feel any effects. You were lucky then, Paula. When I was young I caught the cogwheel train to Grindlewald and I could look across the valley to Jungfrau from our hostel terrace. It is a wonderland for sure. I would not have liked to do the trek you did though. My favourite photo is of the Glacier. No photos can do justice to this place. Great post! I was here in June and will be doing a post on the experience myself, but I completely agree with you. Being there in person is so much better than you ever imagined. Switzerland is for sure a beautiful country! I would love to go back for longer. Great to hear you've been there too, Alyssa. Jungfraujoch is so unbelievably impressive, isn't it? Sorry you got sick, that part didn't sound very fun. The rest, however seems like a great experience, and the photos - wow. What's scary when you feel sick at the top of the mountain is that you can't see any help in site, so all you can do is just sit and wait. I didn't expect to get altitude sickness. Maybe it was because of the cold also, who knows. I have seen the climbers up the rocks above the glacier carrying skis, climbing and survival gear! A nice spot for everyone: tourists and athletes alike.